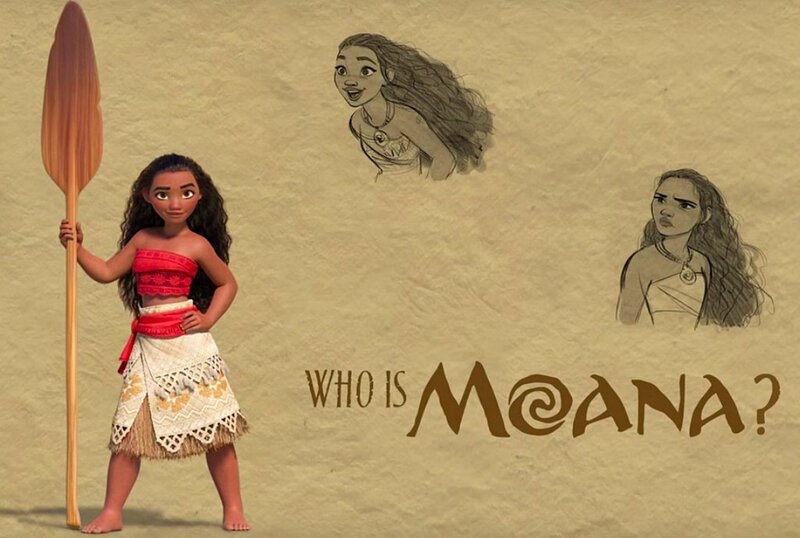 At one point in Disney’s new fantastic movie musical Moana, the title character, a strong-willed, 16-year-old princess seeking the help of a demigod to save her Polynesian island and its people from starvation, is belittled when she balks at the idea of even being called a princess. “You wear a dress and you have a cute animal sidekick. I’m sorry, you’re a princess,” says Maui, the very demigod who Moana sought out for salvation, yet who greets her with patronizing comments and male chauvinism. It’s the line that will launch a thousand thinkpieces because that’s just what we do every time Disney releases another one of its dreaded/beloved princess movies. From Snow White to Tangled, Disney has offered the world repeated tales of impossibly pretty women (look at those hips!) being defined by men, twisting feminists into knots in the process. It just so happens that many of these movies are stone cold classics which put forth various innovations in animation, leaving some to rail against the ugly message behind Beauty and the Beast (i.e., “staying with an abusive boyfriend is okay because you will change him”) and others to rhapsodize about the utter beauty of the film, an early triumph of computer-augmented hand-drawn animation. Yet the debate rages on as to whether or not these movies (and now TV shows, based upon The Disney Channels’ recent programming) are good for kids, giving generation after generation of parents pause as they watch their children inevitably sucked into the Disney princess machine. Disney has chipped away at the many counter-arguments and lingering unease over the princesses through incremental progress. Over the decades, the initially passive princesses have given way to ones who are a little more proactive, and the lily-white worlds they occupied have diversified, extending the representation flag to colonial era Native Americans (Pocahontas), the ancient Middle East (Aladdin), Southern and Northern Dynasty China (Mulan) and the modern day African Americans of New Orleans’ iconic French Quarter (Princess and the Frog). But to some the “progress” in these movies looked more like cultural appropriation, and while the princesses have indeed become more proactive they’re still stuck inside familiar narratives with obligatory love interests. Even Frozen, so frequently and rightfully praised for its focus on the love between sisters Anna and Elsa, has a couple of male love interests around (one of whom turns out to be the villain) as well as a spare animal sidekick or two. So, while Disney has certainly been evolving its princesses it has not been doing so with the speed and deftness required to completely please cultural critics, even as the less discerning masses continue to prop up the whole enterprise with their continued patronage. Moana could have very easily been but the latest imperfect evolution of the Disney princess ideal. The co-directors, Ron Clements and John Musker, previously made The Little Mermaid, Aladdin and The Princess & The Frog, but had never made a computer animated movie before. Similar to Aladdin, the story features a trickster god, the aforementioned Maui, voiced by a celebrity (i.e., Dwayne Johnson) with a seriously outsized and hilarious personality, thus constantly threatening to steal the movie from everyone else. 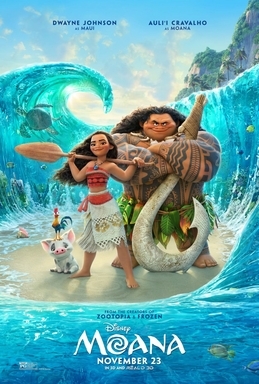 Also similar to Aladdin, Moana represents a cultural first for Disney, expanding into ancient Polynesian legend, with the story set 2,000 years ago around the islands of Samoa, Fiji and Tonga. Plus, yeah, the princess at the heart of the story does indeed wear a dress and sport a cute (or cuteish) animal sidekick, the dimwitted chicken she calls Hei Hei. She also has a pet pig, though he doesn’t join her on her journey. Surely the computer animation neophytes got something wrong, and surely the 8 credited writers (Jed Bush as the sole screenwriter, 7 credited for the story) as well as 3 song writers (Lin-Manuel Miranda, Opetaia Foa’i, and Mark Mancina) offended the natives by Disney-ifying their legends. Surely Moana is somehow an imperfect messenger for little girls to latch onto. At the very least, surely there are a couple of obvious filler songs that stop this from being a masterpiece. Actually, no. Moana is, honestly, about as perfect a Disney princess movie as we have ever seen. The animation is absolutely breathtaking, transplanting the stunning photorealism of The Good Dinosaur into a completely different environment (sandy beaches and open ocean water instead of rocky mountains and open pastures) as well as into a story more deserving of the visuals and hard work of the artists behind the visuals. Newcomer Auli’I Cravalho impressively holds her own as Moana opposite Dwayne Johnson, and the story is about as respectful to indigenous legends as any Disney movie could be. There is one song you could probably cut without losing much to the story, but you’d be missing out on Jermaine Clements singing Lin Manuel-Miranda’s lyrics, a far too enticing combination to pass up. The rest of the songs, from the toe-tapping sounds of Maui’s “You’re Welcome” to the rousing anthem “We Know the Way,” are instant classics of the genre. I think there’s an aspect of Moana that separates her from the other Disney heroines, certainly the ones that we’ve done, but also all of them, in that there is no romance in the story. That was always the intention, once the story of this 16-year-old girl emerged from our research. She is the hero of the story, in an action hero mode. She goes on a journey and quest, and her mission is to save her people, while she faces obstacle after obstacle. She has qualities of relentlessness and great empathy, and she becomes the person that she’s meant to be. All of those things make her a little different, I think. I think it’s hit the major media that Moana doesn’t have a love interest, and they’re like, ‘Oh no!” But it’s like, ‘Oh, yes!’ Moana doesn’t need a love interest. Her journey — finding herself — is something she does all on her own. I’m so excited for young girls and other women and everyone else to see this film because finding yourself should never be compromised. Moana is so effectively built up as a character through the course of the story that when she yields the fight to Maui, telling him to go save the world – oh, btw, their quest culminates in a battle with a fire demon – it feels wrong. It’s actually jarring to see Moana suddenly taking a backseat in her own story, the little girl relying on the male god to save her, momentarily turning her into a glorified cheerleader. Give it a couple of minutes, though, and Moana will be back in charge of the story, plunging into danger to save the world herself, realizing you can’t simply wait around for the guy to do it for you. While this transition takes but a mere couple of minutes in Moana it’s been literally decades in the making for the Disney princess movie. That’s not to say some of the more recent Disney movies, including the live-action re-affirmation parody Enchanted, haven’t presented princesses who were ultimately the heroes of their own story, but none have quite realized it the way Moana does. Gorgeous to look out, enchanting to listen to, hilarious to laugh along with and positively inspiring to watch, Moana is the perfect realization of just about everything a Disney princess movie can be. Loved this movie. I took my kids last weekend and agree: It’s so nice to finally see a Disney Princess movie where she’s not mooning over a boy and just takes action and saves the day. It’s the exact reason I got my young daughter watching the Star Wars Clone Wars series. Young strong female characters are hard to find. The “young strong female characters” are hard to find argument is one of those things people kind of just generally know, but don’t really know or completely appreciate until they have a daughter/niece or some other such dependent to motivate. In my case, I have a 4-year-old niece who almost freakishly gravitates toward any franchise where she can see herself represented. For example, ever since I showed her the female Thor in the comic books she struggles to understand why there’s this other dude claiming to be Thor in the movies. And when you watch Moana with someone like her you can really appreciate not just the presence of a Disney princess who has no prince or desire for one but also a Disney princess who ultimately does battle with another misunderstood woman (or goddess, technically) who turns out to be a force for good when treated properly. Lastly, it’s funny that you’d mention Clone Wars because my niece is all about Ashoka and Rey and Leia. She couldn’t care less about Luke or Anakin or any of the Star Wars boys. Thanks for reading. Apologies for taking so long to respond.